Bold For Spring! Patterns, Styles, and Colors! We always tend to be more pattern and color conservative in the Fall and Winter! Does anyone else notice that?! And as soon as Spring arrives, we are ready for brighter colors, patterns, and styles! Spring in Texas is always mildly warm, so we only have a few weeks to layer outfits or even wear coats and blazers! Here are a few looks I've styled so far that incorporate bold prints, like polka-dots, bold patterns, and Spring styles! As always, may you find great deals on pieces you love and will wear more than once! Clearance finds are always the best! 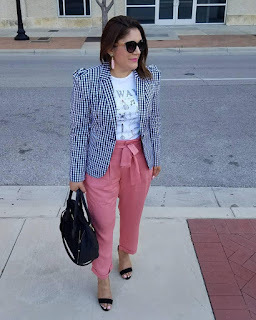 And I know that I have told you all that I love finding clearance items that I can style different ways and wear more than once! Spring Floral's From The Clearance Racks! Hello my beautiful Fashionsta's and faithful readers! I have been away for a bit trying to organize my family events and schedules, thus causing me to drift away from blogging! But, now is the time to come back on and share some pretty outfits and details just in time for Spring! 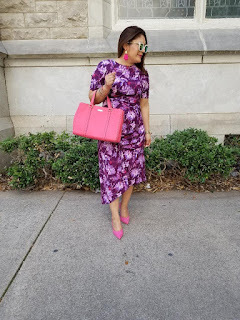 All of the floral pieces for each outfit are from the Target brand Who What Wear, and all were marked down fifty percent from the original tag! The dresses were $17.48 and the blouse was $12! What I love about this brand for Target is that they are so chic and pretty!